Floors - Leather Interiors and Design Inc.
Real leather floors are made of 10 ounce steer hide that is aniline dyed thought with no polyurethane topcoat. 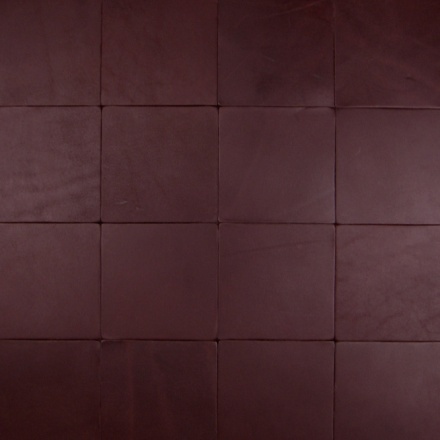 Our tanning method produces leather floor tile of uncommon beauty and strength. Warm, elegant and distinctive, our tile will age with a beautiful patina and gain character with every year. 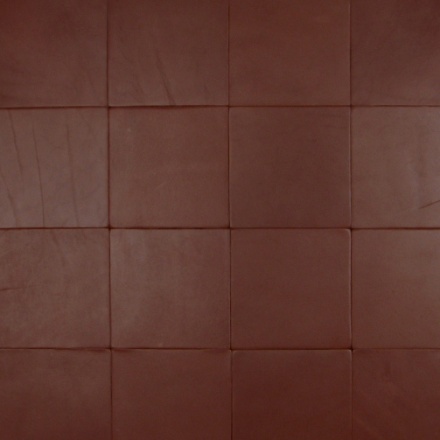 Leather floor tile is stocked in 11 stock colors, with custom colors available. 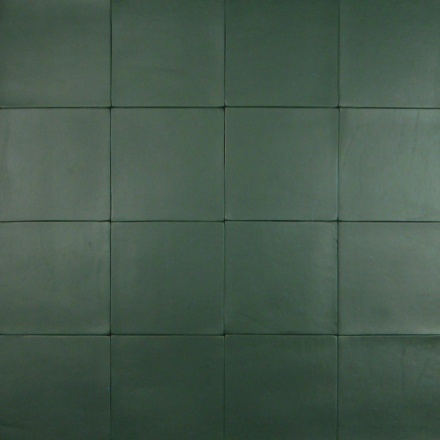 Used in hotels bars, clubs, restaurants and homes, leather is tough and long lasting, yet easy to maintain. Leather wrapped moldings are the perfect Finishing Touch for your leather floor. Few things possess leather’s enduring beauty, strength, and quality. HUNDREDS OF EMBOSSINGS, LASER TOOLING AND CUSTOM SIZES ARE AVAILABLE. TILES COME IN WHITE FOR BORDERS AND ACCENTS, CUSTOM COLORS AVAILABLE. Please note: Leather floor tile should be installed only by professionals accustomed to installing leather tile, cork tile and custom vinyl tile; we offer installation and or consultation, we will send one of our technical experts to any of our projects that require it. 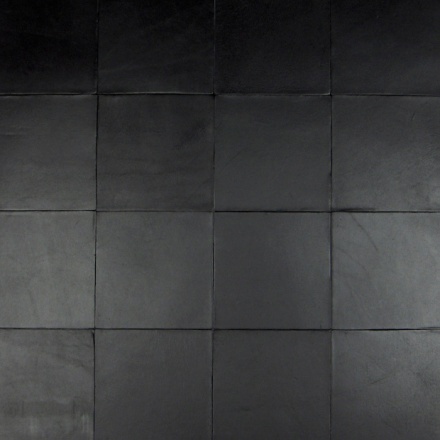 Leather floor tile can be glued to any plywood or concrete surface that is uncoated, unpainted, oil free, clean and dry. Painted or treated surfaces must be stripped free of all treatments, old adhesive or other contaminates that might act as a bond breaker. 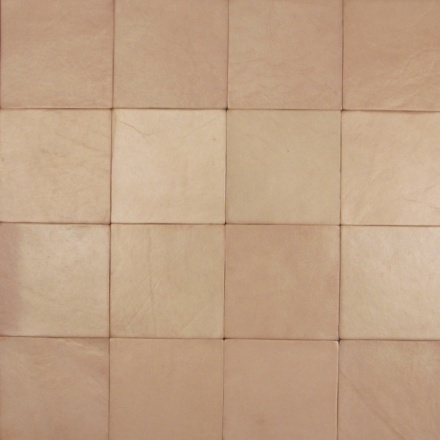 1 – Acclimate your leather tile by opening the packaging and storing the tile in the space it is to be installed for 5-7 days at the average temperature and humidity that the space will be maintained. 2 – Preparation of your sub-floor is one of the most important parts of this installation. All floor tiles of a resilient nature i.e. leather, vinyl, cork, rubber, etc. will “telescope” the surface under them. That means a grain of sand under them will look the size of a green pea, preparation of the substrate is very important. Plywood Floors: (Do not use Luan) Prior to installation, if required, all protrusions, nails, screw heads and the like must be below the floor level and any high spots should be sanded, leveled, repaired and all holes and crevices filled and patched using a wood filler product or floor patch specified for wood flooring. Concrete Floors: Must be leveled and patched using a Portland based patch or other floor patch specified for use on concrete. On grade and below grade concrete floor must be checked for moisture and alkaline salts. 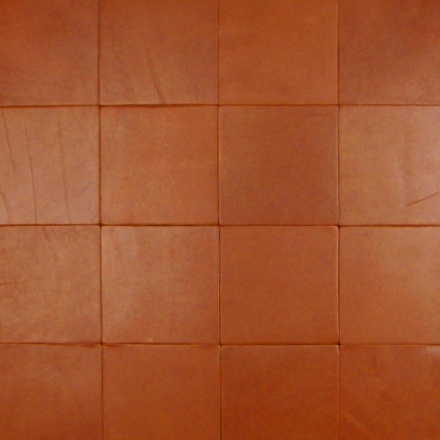 3 – Our leather tile must be installed only with a full spread of our premium, “non-flammable” Stampede adhesive. This adhesive has low VOC content, making it safe and environmentally friendly. Using a brush and a smooth foam adhesive roller, coat both the back of the tile and the floor with one even full coat of adhesive. Avoid getting adhesive on the face of the tile. Wipe off any excess adhesive at once using a damp cloth. Do not install the tile until the adhesive is completely dry to the touch. Install tile in the normal stepping technique. 4 – Roll the entire space with rubber hand roller applying pressure to bond the tile to the sub-floor. 5 – After installation your new leather floor must be swept clean, pre-waxed and waxed, using our Fineschmecker bee’s wax and pre-wax, following all directions to ensure the look and life of your leather. 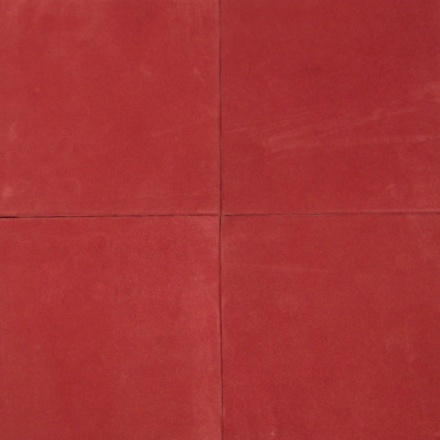 Caution: When installing leather tile on radiant heated floors, contact us for additional information. Our technical department and installation experts are always available for you to consult with. 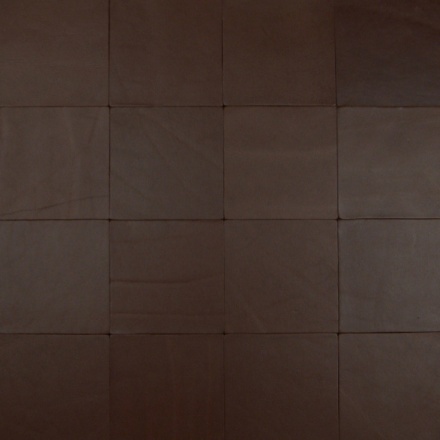 *Due to the tanning, dying and waxing used our lifetime leather floor tiles have: 1 – Increased dimensional stability, 2 – Water repellency, 3 – A finish that shines without being slippery, 4 – A look we like; natural and under processed, 5 – Resilient, enduring, warm, tactile and distinctive. 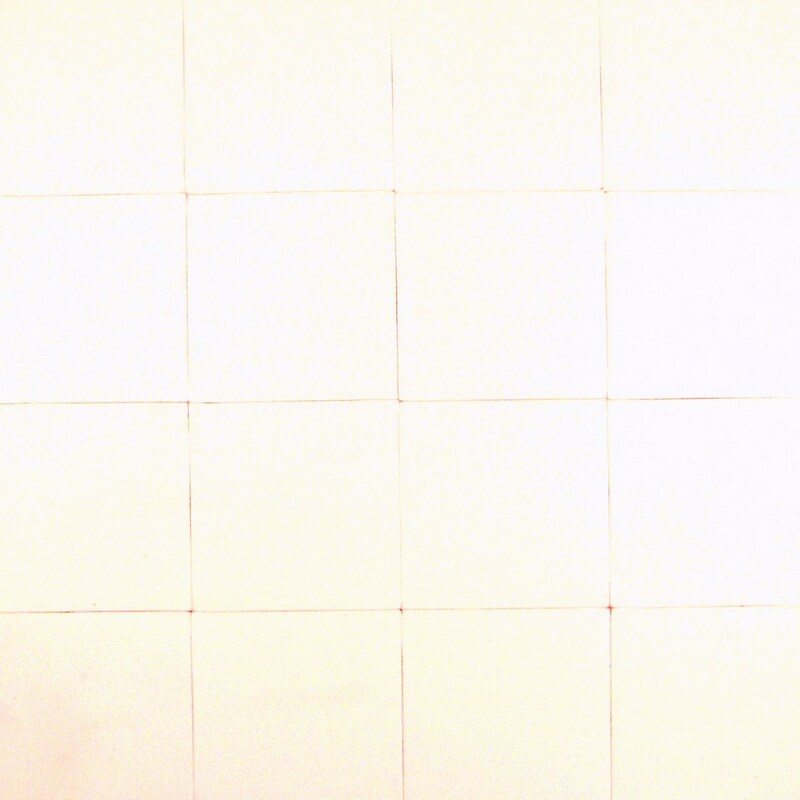 TILE SIZES (in inches): 2x8, 4x6, 6x6, 6x12, 9x9, 9x12, 12x12, 9x18, 12x18, and 18x18. MAINTENANCE: Fineschmecker whipped Bees Wax. INSTALLATION: Use only Stampede Adhesive to install our leather tile. 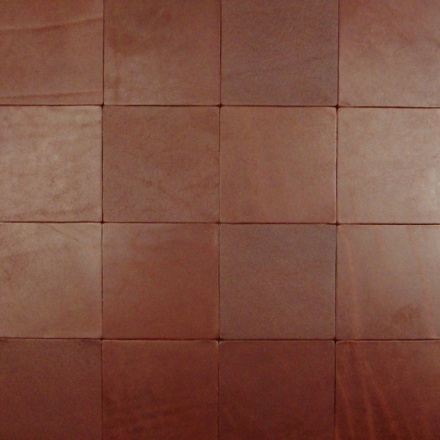 Our leather floor tiles are easy to maintain. 1-Dust and sweep often to remove grit and dust use a damp mop as needed to remove dirt (Use a damp mop NOT a mop soaked or saturated with water). Wax anytime the tile looks dull or scuffed, once a month on average or apply wax just to keep the leather well conditioned. You can also just wax the traffic lanes if they start to look scuffed. Many people like the scuffing as part of the look they want from the leather. 2-Apply wax with a clean cotton cloth, saturate the cloth and apply in a circular motion. APPLY SPARINGLY AS LITTLE GOES A LONG WAY, DO NOT PUT *”LUMPS” OF WAX ON THE LEATHER. 3-Allow wax to dry for 15-20 minutes, then buff. Our wax will not make the leather slippery; in fact it creates a non-slip surface. For large areas you may want to use a 12” hand held buffer, one with a terry cloth bonnet and change the bonnet if it gets clogged with too much wax. *How to avoid “lumps” of wax: Fineschmecker is a mild bee’s wax and will not bother your hands if you are concerned wear gloves. Put wax on a cloth and take your other hand and wipe the cloth so it’s glistening but there are no white lumps of wax showing. You do want a cloth that’s saturated. COMMERCIAL AND HEAVY TRAFFIC AREAS: Use Fineschmecker bee’s wax, following steps 1,2 & 3 above, then apply 2 to 3 coats of Butcher’s Bowling Alley Wax (Your local hardware store will have it). Apply sparingly and buff. This is a harder, tougher wax. DO NOT APPLY BUTCHER’S WAX WITHOUT THE FINESCHMECKER PASTE FIRST OR IT MAY CAUSE A WHITE HAZE ON THE LEATHER, WHICH WILL BE DIFFICULT OR IMPOSSIBLE TO REMOVE. CUSTOM WRAPPED LEATHER MOLDINGS TO MATCH OR ACCENT. As a courtesy to our clients we will ship full hides to your upholster. Production and delivery 4 – 6 weeks FOB California.